Struggling to complete a project, but distracted and distressed by noise? There’s always the Fortress of Solitude, but that’s too far to go. The Cone of Silence never seemed to work that well. And who really has ready access to an isolated sound-proof booth? Harmonic Convergence: SoundCurtain also provides visual feedback, with a distinctive waveform indicator that bounces, slides, and jumps in response to incoming noises. SoundCurtain from FutureAcoustic, may be just the tool you need to banish distracting noise while focusing on the task at hand. 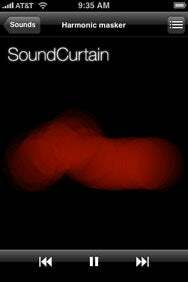 The $4 app distinguishes itself from similar applications by incorporating an “adaptive masking technology.” SoundCurtain listens to and analyzes sounds in the environment, responding with content specifically designed to mask ambient noise. Changes in sound—pitch, volume, duration, and the like—prompt the application to respond with its own changes in output to best mask the noise. My tests of SoundCurtain generally supported the developer’s claims, although results varied based on the type of headphones in use, the specific noise masker selected within the app, and the type of noise being combatted. SoundCurtain was especially effective at eliminating noises containing limited structure and variability—for example, a 40-decibel coffee house buzz slipped easily into the background. The more structured noise from a nearby video game, while just as loud, brought a bit of a challenge to SoundCurtain. The app provides adjustments to help address these issues. A sensitivity setting instructs the application in how quickly it should respond to a noise. A minimum noise level keeps the sound from fading away to nothing in a quiet location. SoundCurtain’s other major variables include the masking noise used and the type of headphones you’re using. Three noises currently ship with the app, with FutureAcoustic promising more in future updates. The Noise masker is reminiscent of traditional white noise generators, while a Harmonic masker uses musical tones to battle extraneous sound. The Rain masker provides a grab bag of sounds—white noise, music, and rain—and was frequently the most effective at eliminating unwanted noise, although its own structure could be distracting. For headphones, the standard iPhone headset/microphone kit worked well. The application uses the headset-embedded microphone to monitor ambient noise—if you plug in headphones lacking a microphone, monitoring switches to the built-in mic. For the hard-core, switching to passive noise reduction headphones—employing a earbud inserted within the ear canal—adds a physical seal against noise that effectively complemented the aural barrier provided by SoundCurtain. SoundCurtain is compatible with any iPhone or second-generation iPod touch running the iPhone 2.2 software update.